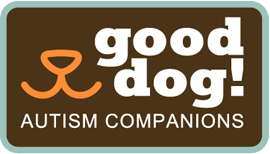 Participate in Autism Awareness Month by entering our Name a Good Dog Pup contest!! Make a donation to enter a name suggestion, if your name gets the most likes on our FaceBook page we will give a Puppy YOUR nickname*. By doing so you help support a child and family living with autism receive an autism service dog. Make your donation & name suggestions by April 21st, then on April 23rd look for your name suggestion on the Good Dog! Autism Companions FaceBook page to vote! The nickname with the most LIKES on April 30th at 11:59pm WINS! Thanks for your support! Dedicated to helping children and families live better lives through autism service dog companionship since 2011. Good Dog! Autism Companions was founded by parents of a child experiencing autism. So, we truly understand the kinds of challenges each autism family can face. Over the years, we have created an amazing support community of Good Dog families, dog trainers, and autism professionals whose caring relationships make us proud to serve everyday. We know that for each child and family living with autism, individual circumstances can be very different, that's why we consider each based on their specific needs. We custom match each service dog to his/her family and train both dogs and people accordingly. Our dogs are intelligent, emotional beings, so we use only positive re-enforcement training methods for them as taught by Bonnie Bergin at Bergin University of Canine Studies. Good Dog! is an ADI (Assistance Dog International) member candidate and we follow ADI standards and guidelines for all aspects of our program. ​To help autism families who are interested in service dogs get more information, we provide a no-obligation, private introductory free phone chat with our director. All gifts are received with the greatest of gratitude.